Rochester, NY-September 20th, 2018-With 21 straight years on Fortune magazine’s 100 Best Companies to Work For list, and consistently recognized as America’s best supermarket, Wegmans Food Markets is renowned for employee and customer care. The care is in the details, and Rochester-based OLEDWorks LLC is pleased to contribute to the superb Wegmans experience with Organic Light Emitting Diode (OLED) lighting installations in select Wegmans stores and worksites. OLED lighting is a uniquely naturally diffused light source with unparalleled light quality. OLED lighting creates an atmosphere that promotes well-being from healthy light without glare. OLEDWorks produces OLED light engines that are integrated into light fixtures by traditional luminaire manufacturers. 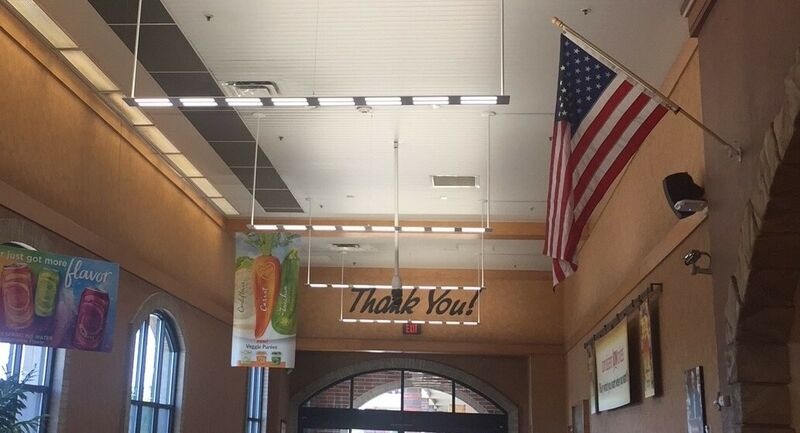 For the Wegmans project, the Olessence OLED lighting fixtures in the vestibules of Pittsford and Henrietta stores are manufactured in the U.S. by Acuity Brands Lighting. Wegmans has also remodeled select areas at their Rochester headquarters with a focus on employee meeting and dining areas. Architectural fixtures for these spaces include the Petal and Limit from Milwaukee-based Visa Lighting and the Trilia from Acuity Brands Lighting. By producing the world’s best performing OLED light engines and combining rapid product innovation, OLEDWorks simplifies and enriches your illuminated space. Free from blue light hazards, OLED is the healthy and beautiful light solution. Sustainable and environmentally responsible, OLEDWorks’ Organic Light Engines enhance the well-being of our world and its inhabitants. You may find the PDF version here.